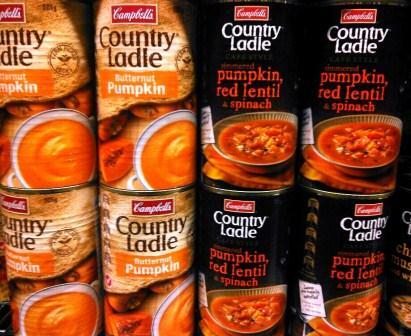 And of course, it didn’t take long for pumpkin soup to hit the supermarket shelves. My history with pumpkin soup started back in the 80’s. Before Y.S. was born. Back then it hit fashionable restaurant mini-tureens with a swirl of cream and garnish of parsley. Also fashionable were high waisted jeans, shoulder pads, pedal pushers, leggings & legwarmers, and colours so bright you needed to wear shades. Wayfarers of course. My hair was scrunch styled with mousse and ultimately sacrificed to a long curly perm. Contrary to fashion trends, preparing 80’s pumpkin soup was a plain affair. Women’s Weekly inspired, I took pumpkin soup into my kitchen. I peeled pumpkin and potato pieces and boiled them with a little onion in stock, blended with cream, and served with extra obligatory creamy dollop. Eventually the advent of dairy fats as cholesterol demons meant cream was ostracised. In the late 80’s early 90’s when I worked at Jenny Craig, low fat ruled my life. Cream substitutes reigned in forms such as evaporated skim milk, and the low fat ricotta cheese (no, not cottage cheese) that found its way into my pumpkin soup. Parsley alone remained as garnish. Along with the re-advent of Hippy fashion in the mid 90’s when I smoothed my hair and fluffed up my wardrobe with floral dresses, lace blouses, and gypsy tops I dumped Jenny Craig and low fat, and discovered olive oil. My new-age pumpkin soup comprised sautéed peeled pumpkin and potato and onion in olive oil, the softened pieces simmered in stock before being blended into a healthy soup. Somewhere along the way I lost my passion for parsley. It was also trendy to combine the pumpkin soup with lentils or carrot, adding middle eastern spices to create an even funkier soup. Later in the 90’s Thai became the new black, and armed with a can opener I embellished with coconut cream, a smidgen of curry paste, garnished with coriander and slivers of chili. While Noughties fashion has been described as a “mash-up” with influences from all over the place and past eras, soup got simple. It was the early Noughties when a co-worker gave me first a sample then a recipe for cauliflower soup. Simmer cauliflower in stock and blend. That’s it. A revelation. Soup was just soup. I made carrot, sometimes carrot & sweet corn, potato & broccoli/mushroom/leek/green pea… but plain soup. That formula didn’t work for pumpkin. The ultimate pumpkin soup is made with peeled pumpkin pieces, potatoes if desired, onion and garlic tossed in olive oil, roasted quickly in a very hot oven then blended up. I make this when I can persuade the G.O. to undertake all that peeling for me. A decade later, pumpkin soup, and good food, has undergone a transformation to slow food, real food. Veges are home grown or sourced from a farmers market. Provenance counts both with food and fashion. Authentic, local and sustainable are the benchmarks. Mostly I make the simplified version… I buy 4 quarters of pumpkin, or for a whole I ask the G.O. to cut it in 4. I have no desire to carry out a D.I.Y. amputation. I scrape out the seeds, give it a good wash then completely wrap each pumpkin piece in foil, shiny side out. I peel the papery outside skin only off 2 large brown onions, and similarly wrap them in foil. Ditto for a couple of garlic cloves – quantity depends on how much garlic flavour you like. It all goes on a tray and bakes in a hot oven for about an hour, checking and taking out the onion and garlic earlier, when my nose tells me it’s ready. After everything is cool, no oocchyy ouchy fingers, the soft inside bits I scrape into a big saucepan, adding a big glug of olive oil, ground rock or sea salt, white pepper and gradually stock, blending with a stick blender until it’s the smooth glossy consistency I’m aiming for. What do I wear while I’m doing this? If you read my previous post, you’ve probably guessed right. Note: Stock = vegetable or chicken. Pumpkin Nook quotes – To err is human, a pumpkin is divine… and more. such a nostalgic trip through the evolution of pumpkin soup … yes, i remember all of those versions, except the low-fat kind, we never did get into that … and i confess to an eighties long-hair perm too … and guess how we make ours now? … no need to say! brilliant post elladee!!! Thank you. I had to laugh when my sister asked me the question with the emphasis on “now”. I’m guessing your pumpkin soup is made from scratch, seeds in the garden version 🙂 If you peel, I hope you are better with the knife than me, as I still have scars to remind me not to go there. I had never heard of nor eaten pumpkin soup until I’d been in Aistralia for quite a few years. I love it and yes, mine has evolved a few times as well… As has my hair from the curly perm! Lol, good fun, thanks elladee! The timing of pumpkin soup in Australia coincided close to your arrival I think. It was new to all of us. Now embraced as a true Aussie food… I’ve lost count of my pumpkin soup and damper dining experiences… except of course for my Dad who just loves the damper, only, preferably with currants and ‘cocky’s joy’. OH yes, it looks as though we ALL had the long curly perm! Thank goodness things have moved on. Sounds like I’m stuck in the 90s with my version of pumpkin soup (at least my hair evolved) so I will try your current version – the pre-roasting has got to add flavour, no? I’ve never even bought pumpkin let alone made or eaten pumpkin soup. Which may possibly be the best way to eat it as it has that soft mushy texture anyway. My neighbour does a neat recipe with a spanish squash where she dices it up and sautés it with garlic and spices. That’s tolerable. But not enough to make me go out and buy some. I didn’t have the long curly perm. I did have something of a Farrah flick though. As seen in my graduation pic over on everypic. I don’t know anyone who had a long perm in fact. Or even long hair. I liked shoulder pads though. And leggings. I still like leggings. If there was a hippy era in the nineties, it certainly by-passed me. Probably because I was still in power suits in my ambitious career mode. I’m not sure when I realised soup could taste good if it was made simply, but the idea of putting ingredients in pan, cooking them and whizzing them up, seemed rather intelligent to me, so it quickly caught on. Why make something difficult when it can be easy? Or even, soup doesn’t have to be hard either. I would have loved a Farrah flick but sadly my hair just wouldn’t cooperate. The Spanish squash recipes sounds lovely – I have made in the past, but you need to do it outside and on the bbq sideburner, neither of which I currently have, a chilli pumpkin stir fry made with sesame oil, fish or soy sauce, garlic… and chilli. It tastes divine but the cooking smell lingers for days. Your reply to Ardysez about pumpkin soup being true Aussie food is probably correct. Before I visited Oz in 2002, the only use I’d ever had for a pumpkin was to make my girls lanterns for Halloween. The couple I stayed with lived a very healthy lifestyle in the Adelaide Hills. C was always cooking and her speciality was pumpkin soup. It was totally scrumptious, and I came home armed with her recipe. I struggled to find the Kent pumpkins she used, perhaps known by a different name here, so ended up buying ones that looked similar. I still have her recipe, so may dig it out and give it another try. As for big hair, I tried a perm in the 70’s when Afro styles were in……..never again! As I was doing a little background research I realised it is the case that pumpkin soup appears to be more popular in Australia than many other places – intriguing. I also prefer Kent pumpkins but have used all kinds, and butternut is very popular. Pumpkin soup is a funny thing, as the pumpkin varies depending in where and how it’s grown, and I often need to vary the salt/sugar I add to bring out the best in the soup. Oh, I love this ‘historical’ tale both of fashions AND pumpkin soup. Altho’ N European born it seems to have been a delicious part of my life here since childhood in all your variations but shall try your newest one tomorrow [yes, it honestly was on the menu!]!! And I never had a perm [Farah Fawcettt look: of course! With blonde streaked hair of a dozen shades 🙂 !] and still love leggings and definitely do things low-fat!!!! I hope you enjoy your pumpkin soup – the weather is perfect. I still have a couple of containers in the freezer of it, for emergency weeknight dinners. I should have persevered with the curling iron and the Farrah Flick myself… the only time anyone came close to telling me I looked like a movie star was when I had a very short bob, and was likened to Doris Day! It was interesting for me to think back on where I was, what I was doing and wearing each time the recipe evolved. I like pumpkin soup but I have to admit the reason for it’s longevity in our house as opposed to other types is that it’s the G.O.’s favourite. I prefer the cauliflower but he hates it. Love the decade fashion changes along with soup changes. I think I’d be hard-pressed to find an actual pumpkin where I live in any month besides October. All I think I could find would be the pumpkin mush from a can for pie baking. This sounds really good and unique. I’d love to try it. We like pumpkin soup here although I am definitely not a soup guru. I do like chopping it myself though. I dig the knife in and slam the lot into the board as though I am chopping wood. BAM! Bits fly everywhere, messy but fun. Kids not allowed in the kitchen at the time! I would like my recipe to start with “go out to the garden” too. Perhaps I should get some seeds off the FIL next time. I have a 25+ year old scar on the base of my left index finger from a pumpkin cut gone wild. It reminds me not to go there. I am allocated a couple of not too big not too sharp kitchen knives, and the rest are the G.O.’s jurisdiction. Even now at TA I’ll throw pumpkin seeds up the back… occasionally LHS neighbour will go easy with the mower, we’ll get enough rain, and we’ll get a vine but without being there it’s hit & miss. Could this be any better? A twirl down fashion lane accompanied by pumpkin soup. A seriously original/ creative post. Matt from Masterchef had a great recipe recently and I tried it and it was really nice, it had apple instead of potato. It was really nice. This is an amazing post. A lovely history shared from such a fun perspective! And, I had never, until now heard of the noughties – seriously. don’t tell anyone. Thank you. I won’t tell 🙂 Just yesterday, reading Barbara Kingsolver’s Animal Vegetable Miracle, she shares her pumpkin soup recipe, now I have another to try. Love Barbara Kingsolver. I tend to use butternut instead of pumpkin but I think it is time to start exploring a bit more.. I tracked down this recipe base idea from seeing your post on The Kitchen Gardens – is sounds sooo yummy. So… I adore butternut squash, so I’ll use that. On another note… I haven’t been blogging – or following – for about a year but I hope to get back to it soon. I remember when you first considering moving out of your flat in the city. I’m so pleased to see how happy you guys are! I think our food languages are morphing but have a few variations still, eg Aussies refer to canteloupes as rockmelons! Lovely to hear from you, and that you are happy in sunny Florida!